Lisa Morris, a young girl who gets regularly vaccinated, gets sick and dies of a particularly virulent strain of measles known afterwards as Morris's disease. Unlike regular measles, this strain spreads quickly, doesn't seem to be affected by the measles vaccine, and leads to the deaths of millions. Unfortunately, Lisa went to Walt Disney World when she wasn't feeling very well, also passing through an international airport, before she died in a hospital near her hometown. The world is in chaos afterwards as the disease spreads and it doesn't stop there. Now, factions form on whether or not immunizations should be forced. Waves of other disease hit and the true horror of Morris's disease shows itself. Kingdom of Needle and Bone shows a dystopian future of increasingly virulent diseases in part caused by the obstinate anti-vaccination movement, which is based on nothing scientific and responsible for recent outbreaks of measles. Morris's disease starts out as a normal measles infections with a runny nose, fever, and sore throat and then progressing to Koplik's spots. Measles rashes appear in day 4 or 5, but instead of darkening, the rashy skin softens and weakens until moving puts the infected a rick of tearing, infections, or encephalitis. As Lisa moves around Walt Disney World and later through the airport, the narration explains exactly how scores of people are infected by her, even though she is careful to cough and sneeze into her arm. It spreads all over the world leaving 30 million infected, 17 million as carriers of the virus, and 10 million dead. Now, with other waves of much more severe versions of diseases, a fatal side effect of Morris's virus reveals itself: the infection leads to permanent immune amnesia, meaning no vaccines will ever work on the survivors of the disease. I looked up this phenomenon and it's apparently an aftereffect of measles, but doesn't last forever. This article details how immune amnesia can reduce herd immunity, which we see in the novel on a much wider, more permanent scale. I had never heard of this at all and it makes the recent real life outbreaks of measles in California and Washington much scarier and have farther reaching consequences. Both of these outbreaks were caused by parents (who are probably vaccinated themselves) simply putting their personal beliefs above the safety of others, including their own children. Considering this, doing away with personal belief exemptions for attending public schools would be an effective step in stopping these outbreaks. Back to the story, Dr. Isabelle Gauley, Lisa's aunt, is working to vaccinate as many people as she can to prevent further outbreaks and infection. She's caught between two factions: one against bodily autonomy in favor of forced immunizations and one for bodily autonomy and against forced immunizations. Of course the bodily autonomy argument gets lumped in with abortion rights, with the anti-choice movement gaining more fervor. Angry mobs stand outside of her clinic due to the limited quantities of vaccines. Her own sister Angela, the one who latches on to any borderline terrorist movement, parades her dead daughter around to head the forced immunization cause even though she spent almost no time with her and gave her up for adoption to their other sister. Both are disgusted by Angela's mercenary use of their loss. Isabelle comes up with a sort of solution after she finds out about the permanent immune amnesia that seems extreme, but would keep the uninfected safe from contagion. 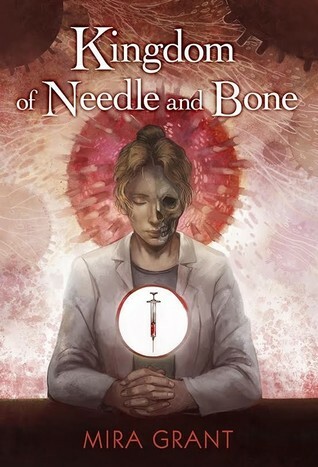 Kingdom of Needle and Bone is a short novella that lays out this dystopian world of disease. Isabelle at first seems like an innocent bystander, but her actual role in everything makes so many things about her become clear. The reveal felt like a slap in the face since we've been by her side for the whole story. If I had the time, I would have read the entire thing with that in mind. She is such an interesting character because she's ok being a monster if it gets the results she wants. Familial bonds, feelings, and the Hippocratic oath don't phase her at all. I would love for this to be part of a larger series that continues and further examines the characters, but it's only just come out. Mira Grant puts a shocking amount of research into each of her novels and this is no different. The things I thought for sure would be science fiction are fact, sometimes made to be more extreme for the novel. In addition to that, she always rights diverse casts to represent a wide range of people and makes them feel eerily real. I highly recommend this book (and all of her books). If the Subterranean Press price tag daunts you out of read this, keep an eye on Amazon for discounts.